Classic "Iron fist wrapped in the velvet glove". Full fruit, floral and graphite aromatics. Powerful and deep concentration of currants and blackberry notes. Subtle spice notes add an underlying complexity. Rich and very full bodied. Powerful and exotic with big structure and yet very polished with a very long finish. The fruit was punched cap fermented and barrel aged for 40 months in selected French Oak barrels then blended prior to bottling. 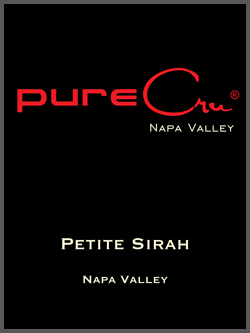 This is the fourth wine made from these Petite Sirah vines. The dynamic results defy the notion that young vines won't make complete and complex wines. This vintage of 2013 produced wines of great intensity and balance.